First up is a story with the offer. Following will be the 3 courses of action you, as an employee, can take. Take note, dates are important in this example. Also, anything in this example is fiction and not based on anyone's real offer. You will have to do some math yourselves to apply it to your own situation. March 5th, "COMPANY" offers you 1000 stock options, and the price was determined at 10 euro per piece. The contract also mentions a vesting period of 4 years. This means you will get the possibility to exercise (pre-pay and own) the stock options over a period of 4 years. So after 2 years, you have vested half of the stock options you were granted and you will have 500 shares of the company. After 4 years you can exercise all the stock options and get 1000 shares. We will also take an assumption and say that "COMPANY" will go public in 1.5 years and 6 months later (usually your minimum holding period) the stock options are worth 15 euro per share. The examples each mention if you sell right away after those 2 years or if you wait 4 years. The share's value has risen to 20 euro in a good example or to 5 euro in a bad example. Accept in written form within 60 days, sign and move on. In Option 1 the payroll provider will get notice from "COMPANY" that you accepted the stock options. Some contracts can have a clause in them that the possibility to exercise those stock options will end within 10 years, but this obviously can differ from contract to contract. First 5 years of the contract are estimated you will get 18% fictional profit, for each additional year you are able to exercise the stock options an additional 1% gets added to that fictional profit. In this example you will get taxed 23%. This "profit estimation" number is a rule set by the Belgian government. See  for details of the law. You MUST reply in written form that you accept the offer. If you accept it in written form, you will apply for this option. This written acceptance notice needs to be provided to your employer. Your employer is responsible to file this against your income taxes. See option 2 for an alternative to this. You can exercise and sell them whenever you get them vested. You are taxed in advance for potential profits. This is good because if it turns out to be a higher profit than the fictional estimated profit, you gain whatever is above what is taxed and you do not have to pay tax on that profit. 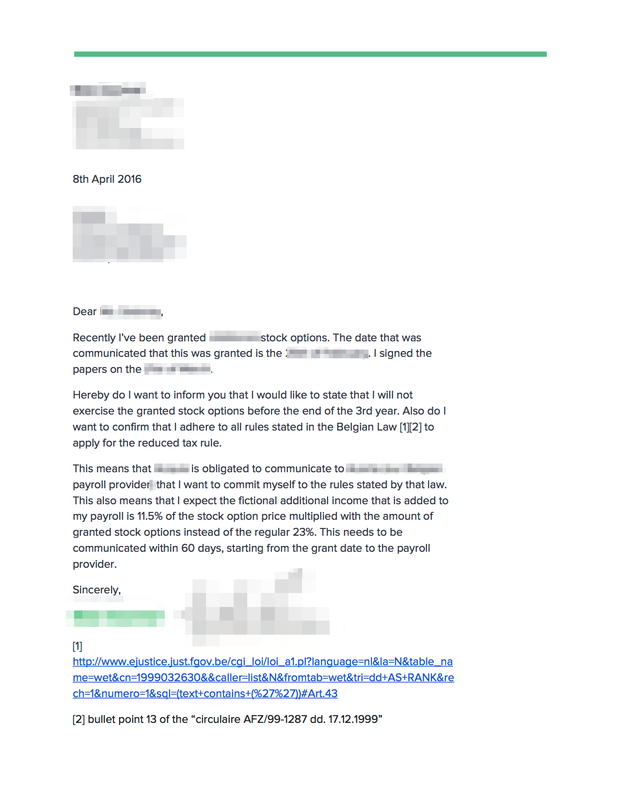 This 2300 euro will get added to your payroll paper as a certain bonus you made but you obviously won't get the money in your account since you "got" them in stock options you decided to bet on. They "add" this on the 60th day of the written notice that "COMPANY" gave. So this was 5th of March. 60 days later is the 4th of May, this means you will see the fictional potential profit on your payroll paper in May. Depending on your tax-bracket this will get taxed as regular income. Since most of us are in the higher segment, this means that you will get taxed for around 53%. See  for details of the income taxes. Total to pay: 53% of 2300 euro is 1219 euro. Selling in 2 years where the share price is 15 euro. In this example you only vested half of your stock options so that's 500. If you decide to sell the remaining 500 shares in 2 years, there are no additional taxes owed to the government. So that's pure profit, unless you leave the company and not vest those stock options obviously. Selling in 4 years where the stock price is 20 euro. Selling in 4 years where the share price is 5 euro. In Option 2 the payroll provider will get notice from "COMPANY" that you accepted the stock options. Some contracts can have a clause in them that the possibility to exercise those stock options will end within 10 years, but this obviously can differ from contract to contract. In addition, you promise the government that you will not exercise and sell within 3 years. First 5 years of the contract are estimated you will get 9% fictional profit, for each additional year you are able to exercise the stock options an additional 0.5% gets added to that fictional profit. In this example you will get taxed 11.5%. This "profit estimation" number is a rule set by the Belgian government. See  for details of the law. You MUST reply in written form that you accept the offer. This written acceptance notice needs to be provided to your employer. Your employer is responsible to file this against your income taxes. You can NOT exercise the stock options before the end of the 3rd year of the start date. You MUST exercise them before the end of the 10th year or before the end of the contract. This 1150 euro will get added to your payroll paper as a certain bonus you made but you obviously won't get the money in your account since you "got" them in stock options you decided to bet on. They "add" this on the 60th day of the written notice that "COMPANY" gave. So this was 5th of March. 60 days later is the 4th of May, this means you will see the fictional potential profit on your payroll paper in May. Depending on your tax-bracket this will get taxed as regular income. Since I will assume that you fall in quite a high segment, this means that you will get taxed for around 53%. See  for details of the income taxes. Total to pay: 53% of €1150 is €609,5. Selling in 2 years where the share price is €15. Hey, you promised NOT to sell! Go to jail. Not really, but you will have to be taxed as in Option 1. Also any following action you take will follow the tax rate of 18%. In this example you only vested half of your stock options so that's 500. Also, you promised NOT to exercise and sell them. If you do this, you will get retroactively taxed at the bigger rate. Selling in 4 years where the share price is 20 euro. In Option 2 the payroll provider will NOT get notice from "COMPANY" that you accepted the stock options. Some contracts can have a clause in them that the possibility to exercise those stock options will end within 10 years, but this obviously can differ from contract to contract. Since you will only exercise and sell whenever the company will go public, you will get taxed for the real profit you made. Much higher potential tax rate. In this example you only vested half of your stock options so that's 500. Also, you promised NOT to exercise and sell them. If you do this, you will get taxed at the bigger rate. This information was obtained over a very long period. I'd love to thank the FOD Financiën from Belgium (Department Ghent) and the unattributed company and Acerta that helped obtain all this information. Many thanks to Wim Leers for the diagram!